For 48 hours, the Plugin Alliance offers discounts on a total five different plugins. 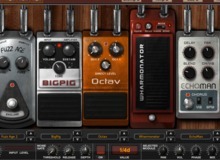 Today only, Waves offers special prices on three of its plug-ins. Kush Audio introduces the Omega Transformer plugins, a series of two preamps emulations based on API and Neve models. Two Notes has released 10 new speaker cabinets in exclusive Two Notes format, all created in France by Black Bear Studio. Toontrack has released the JamTrack Amps EZmix Pack, which includes 50 signature sounds from five renowned guitar players. For Easter, the Plugin Alliance offers 5 special deals including a $19 "surprise egg plugin". EZmix 2 is turning four, and to celebrate this Toontrack offers 20% off on the entire range of EZmix packs. Hornet Plugins has released Guitar Kit's v1.1.0, with a new input circuit type feature.